On a beautiful late September morning, we get up early to rush down to Ormos Panagias, an attractive little harbour town on the east side of the Sithonia peninsula of Halkidiki. The weather is beautiful for this time of year. Sunny and with a temperature in the high 20’s, the conditions couldn’t be more perfect to experience a day cruise in the north Aegean sea. Our destination? 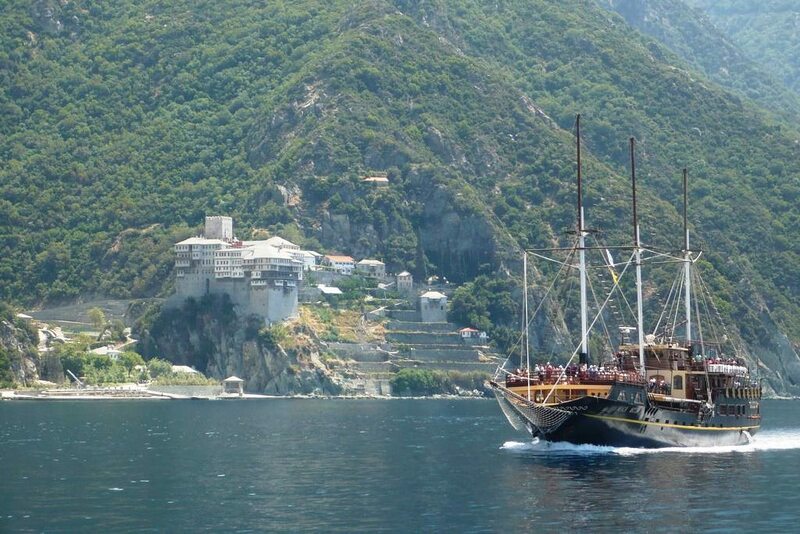 Cruising along side the ancient monasteries of Mount Athos. This is one of the top reasons for tourists to come here. 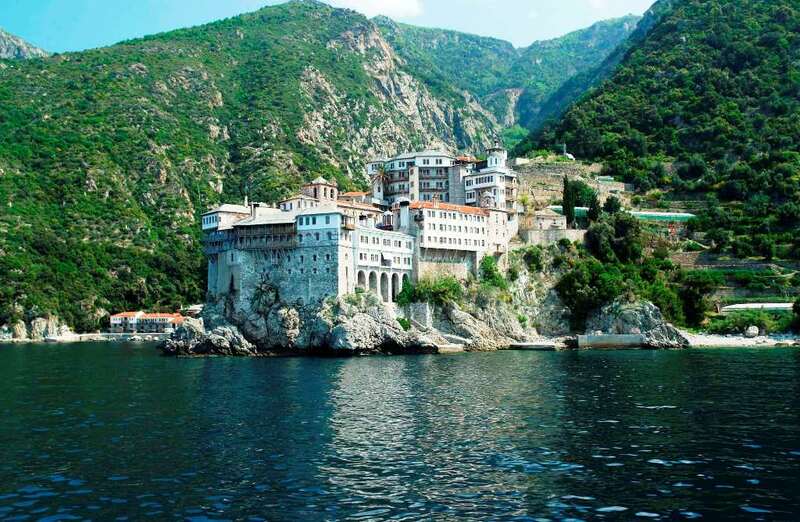 Mount Athos is a monastic republic, walled off from the rest of Greece. The only way to enter is by boat through a port of entry and then by foot to the monasteries. The catch is that no women are allowed and the daily number of visitors are restricted by entry permits that are obtained in advance. 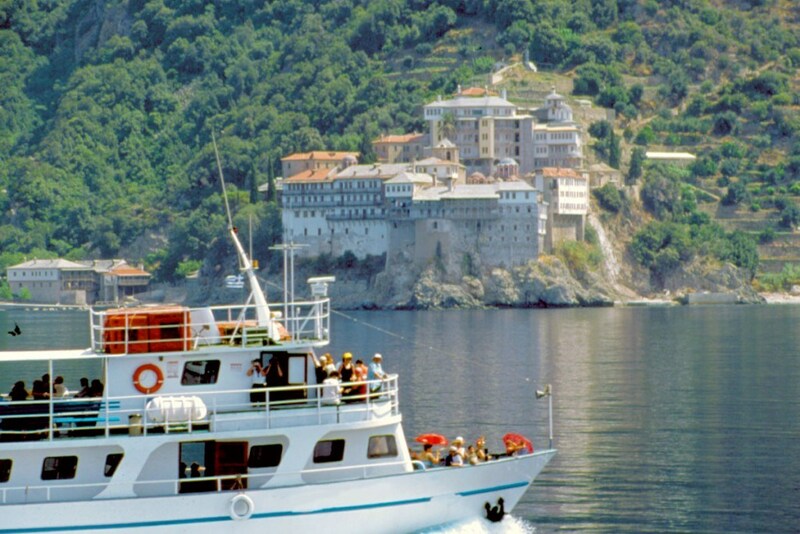 So the next best thing is to go on a boat tour that cruises up the western side of the Athos peninsula. As we drive into Ormos Panagias, we join the masses of people that descend on this village at 9 am in cars and buses, all with the goal of boarding one of the several boats bound for Athos. We have tickets for the pirate ship ‘Menia Maria III’, a large ship that can hold up to 600 people over 4 different levels of decks. The attraction is that this ship (newly built – 2004) was designed in the style of a 17th century galleon, giving you a feeling of going back in time. Just seeing this ship advertised on the Internet, I wasn’t going to settle for any other boat. And yes, it comes with a pirate! With his 18th century flint-lock pistol pointing at their backs, he seemed to be more of a hit with the older women than he was even with the children. Just don’t let him kidnap you. As you depart in the morning, the trip to the southern tip of Mount Athos is about 2.5 hours. If you are fortunate, you may even be entertained with dolphins that play in the waters of the Aegean and from time to time accompany the ship on its journey. Around noon, you reach the monasteries that start from the southern tip of Mount Athos and are scattered along the shore of the Athos peninsula. A guide gives a well-prepared description of all the monasteries and their history in Greek, English and German. Some of this architecture is dated back 1000 years and were built on foundations that go as far back as the 4th century AD. 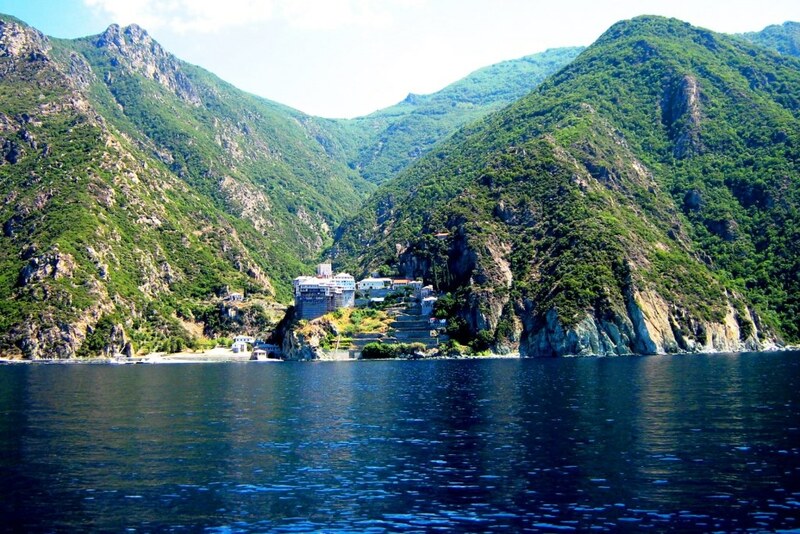 Find out more information about the monasteries of Mount Athos. The peninsula has been inhabited by monks for the last 1000 years. The untouched surrounding forests give you a beautiful view from the boat of densely forested slopes with ancient monasteries clinging to cliffs, framed by a dramatic background.